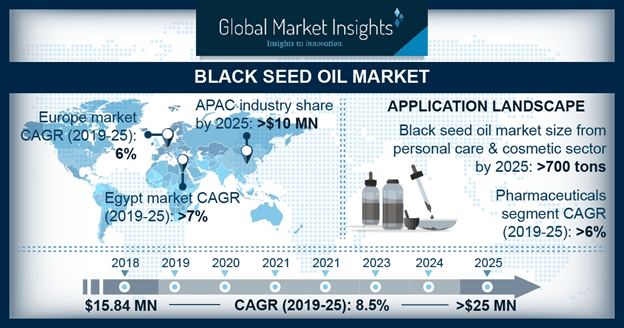 Black Seed Oil Market size will cross USD 25 million by 2025; according to a new research report by Global Market Insights, Inc. Growing application range in pharmaceuticals, cosmetics and nutraceuticals may propel black seed oil demand. Nigella sativa contain anti-fungal, anti-bacterial, anti-oxidant, insulin sensitizing, anti-inflammatory, antiviral, anti-hypertensive and insulin sensitizing properties, which enables it to have wide range of applications. Growing emphasis on natural based products owing to their health benefits and nontoxic nature will foster industry growth. Presence of micro components including mystric & steric acid, proteins and vitamins B1, B2, B3, folate, copper, iron and zinc allow the product to have application as a functional food and dietary supplements. Additionally, cumin seed oil can be utilized as herbal medicine for sores, bites, rashes, inflammation and skin irritation, thereby driving black seed oil demand. Capsule based nigella sativa oil demand may exceed USD 1.5 million by end of forecast period. Growing product usage in nutraceuticals as dietary supplement or functional will favor industry growth. Increasing consumption of food supplements in capsule form due to easy digestion is likely to further boost industry growth. Germany black seed oil industry share from cosmetic & personal care application is likely to witness significant gains at over 6%. These products have soothing and anti-inflammatory properties which suits skin and cures eczema, acne and psoriasis. Growing personal care market size globally is likely to favor industry growth due to its usage in shampoos, soaps, skin care products, massage oils and fragrances. Lack of research, availability of numerous essential oils and its potential toxic nature at high dose is likely to hamper industry, thereby affecting black seed oil price trends. These products can allergies and rashes if applied directly on skin and can also affect liver and kidneys, if consumed too much, thus further affecting industry growth. U.S. black seed oil market size from nutraceutical application may surpass 130 tons by 2025. Shift in consumer preference from synthetic to natural ingredients along with mounting demand for sustainable products is likely to drive regional growth. According to the research, consumption of cumin seed oil may help in lowering body mass without any significant side effects. Growth in obesity rate in this region has expanded the market for functional food and dietary supplements, which will thereby favor regional product demand. India black seed oil industry size from culinary applications is may grow over 7% by 2025 due to its usage as providing flavor and aroma to numerous curries, breads and bakery products. Wide usage of spices in Indian cuisines in order to enhance taste and smell of curry is predicted to fuel black seed oil demand. Egypt black seed oil market is poised to witness gains of over 7% owing to high production of cumin seed oil due to easy raw material sourcing. Growing product usage in breads, naan & curries for taste and health benefits is anticipated to stimulate industry size. Global black cumin seed oil industry share is highly fragmented among player including, Manish Agro, Sanabio, AOS Products, Sabinsa Corporation, Amazing Nutrition, Flavex, Henry Lamotte Oils GmbH, Z-company and Kerfoot Group. Manufacturers are expanding the farming of black seed owing to high demand along with improving extraction technique in order bring down production cost.